A year ago I read "The Happiness Project" by Gretchen Rubin where she did month long projects for a whole year to increase her happiness. It was an enjoyable read and I really liked the idea of monthly projects. So last November I started my first monthly project. The aim of November was to write 500 words a day on any subject. It could be blogging, journalling, writing stories - anything really. Apart from one day, where I fell asleep early, I completed it. I really enjoyed it as writing is my thing and it gave me a wonderful buzz. This month I found that writing regularly really perked up my spirits. I've been writing my travel blog , Life in Northern Towns, since April 2009 and really enjoy doing it. In November 2012 I had an invite to a blogging event in Manchester at Carat, a media company. It was an inspiring event and I learnt more things about blogging in those couple of hours than I had done in three years of blogging. So December became blogging month. By the end of the month I manage to triple my traffic, I SEO'd my blog and generally smartened up my blog with photos and links. This month managed to rejuvenated my passion for my blog. A New Year often brings health resolutions and I was no different to the rest of the world. Like the rest of the world I fell of the rails half way through the month. I chose this challenge for the wrong reason - I thought I 'should' get healthy rather than I 'really want' to get healthy. That mindset set me up for failure, however it was a great lesson to me to go with the 'wants' rather than the 'shoulds'. In order to make up for the failure of January's challenge, I chose to do craft month. I love crafts. There is nothing more satisfying than making something beautiful out of some scraps of wool and fabric. I did some embroidery. I made a pin board with the aid of an old canvas, scrap fabric, ribbons and a trusty staple gun. However most importantly I finished my mammoth knitted blanket made from chunky wool, 10mm needles and lots of determination. 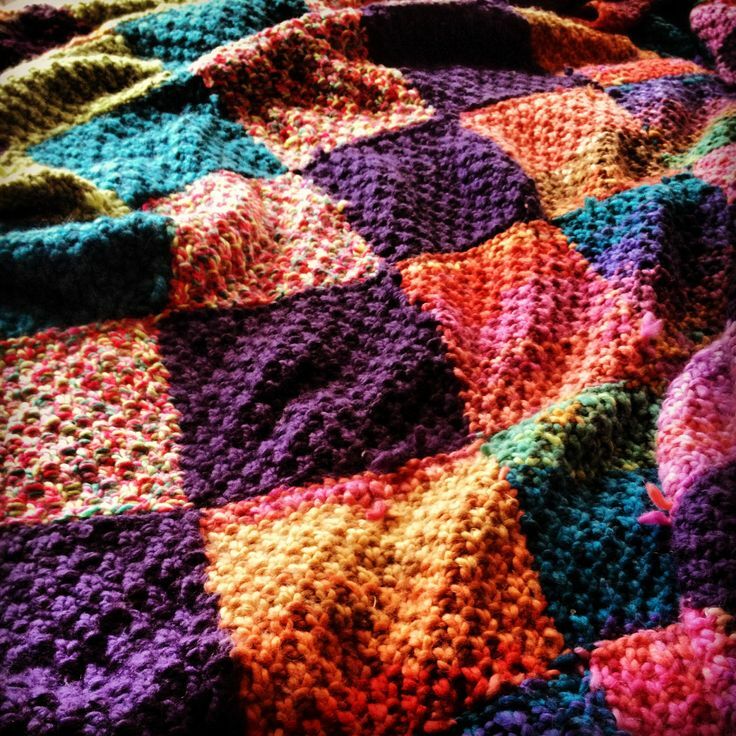 I love the blanket, it's big, colourful and really warm. On the downside I did give myself I hand injury and I've been unable to knit since. In fact it's led to a series of medical tests to get to the bottom of the problem. I learnt from this month that you don't half feel ridiculous to admit to a Consultant that you caused a hand injury due by having a bad knitting technique. Everyone is supposed to have a novel within them and I've been toying with an idea for years. So I thought this month I would have a crack at it. I had a dedicated notebook for the purpose and each day I noted ideas down for the grand novel. I didn't get as far as I thought I would. Part of me thinks I'm not quite ready for it. On the plus point I did get lots of ideas for it. I can't say I succeeded with this month's challenge, but it gave me food for thought. I've always loved reading, but recently I've had a problem finishing books. This month I promised to complete four books. I actually finished seven. This month reminded me how books are an important part of my life and how much joy I get from them. A very successful month indeed. I've always been a bit crap with money and stuff. This month I decided to get a bit better about it. I read a book called "Ausperity" by Lucy Tobin about how to be more savvy about money. I signed up to Quidco to get cashback on purchases (I did get some cash back - not much but it's better in my pocket than somebody else). I did on line surveys for cash or prizes (too time consuming for what you get). My blog is now on Kindle (no takers though). Got a bit more sorted with vouchers for shopping trips (it does actually save money). Sorted out Adsense on my blog (not sure that works really). In fact I signed up for a start up course with Enterprise Nation (very interesting). Middling success. Someone on Facebook mentioned you could do free on line courses with top universities. I love learning so I ended up browsing the Coursera course list and signed up for a few courses. Unfortunately these courses don't cover convenient month length blocks, so this challenge stretched over 3 months instead. The first course was an Introduction to Art: Concepts and Techniques by Penn State. I chose art because I really enjoy it and get real kick out of it. The course I really liked although I didn't end up doing as much art as I wanted to. 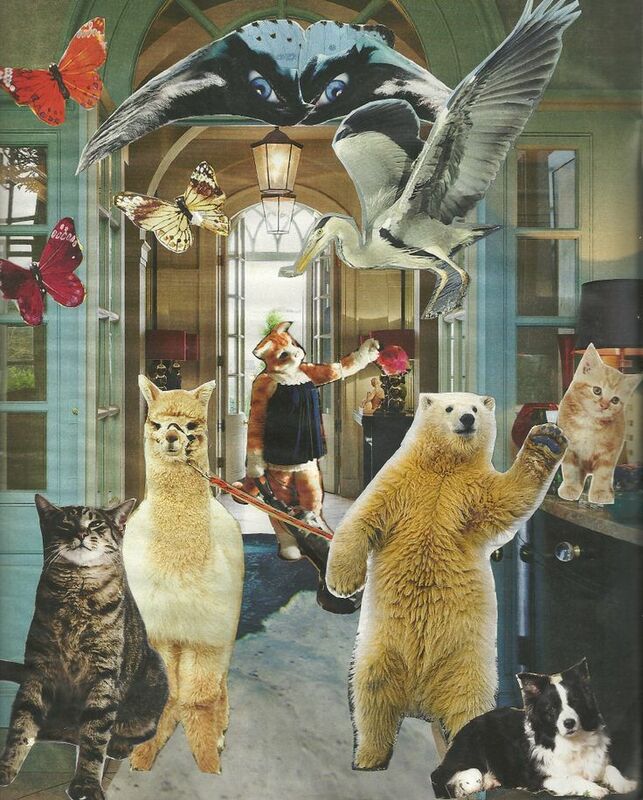 There was a lot of collage within the course, but the videos were really well made and I learnt more about art. I got a Distinction with 91%. The second course was Nutrition and Physical Activity for Health. I did it as I thought it would be useful for work. Unfortunately I found this course rather boring. How I got a Distinction and 95.5% is a miracle. My dogged determination came to the fore on this course to get through it. This was a definite 'should' challenge. I've signed up to three more courses to the end of the year. I heartly recommend them if you want to find out about stuff in an interactive fashion. Do challenges you want to do, rather than what you think you should do. You will stick to the challenge by going with your interests. Creative challenges rock my world. I love learning - I swear it's part of my DNA. These challenges help to embed new habits, give different perspectives on life and open your eyes to new ideas. Most importantly, having a monthly challenge is good for the soul.